Proocam Pro-F059C Jaws Flex Clamp with seven joint stand for your GoPro or Action camera to objects ranging in size from 0.6cm to 5cm in diameter using the Jaws Flex Clamp. Attach your camera directly to the clamp for low-profile mounting, or use the included neck to achieve a wider range of camera-angle adjustability. Jaws securely grips irregular shapes and super slim objects thanks to its innovative design. Enables a GoPro and action camera to be clamped to objects ranging in size from .25” to 2” (.6cm to 5cm) in diameter. 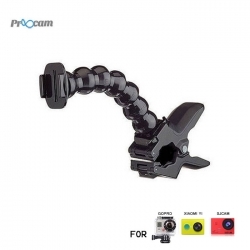 Camera can be attached directly to the clamp for low-profile mounting, or use the optional neck to achieve a wider range of camera-angle adjustability. Jaws securely grips irregular shapes and super slim objects thanks to its innovative design.